The country of Alkairyn has been stained by the growing touch of a blight. Named the Shadow because of its darkness, its strength is only possible because the soul of the earth has fractured. Unaware of the power she carries, half elf Akairya is forced to flee her home city as it is destroyed by the Shadow's children, Roraks, and dragons who have embraced the poison. Through the push of fate, Akairya comes across a dragonling, and together they stumble on a journey that will shatter their perception of spiritual identity and morality, and eventually prepare them for the battle against the highest power of the Shadow; the Shadow Lord. Though they have many questions, one burns the harshest. Will they succeed? When Abrianna Leaming was only eight years old, she 'wrote' her first book and created imaginary worlds and scenarios that actually quite worried her family. "Will she ever be able to tell what is fantasy and not fantasy?" They asked themselves. Luckily, she simply grew up into what we call a writer. Now 24 years old, Akairya is her first novel. She lives in Chilliwack, British Columbia, where she rides horses and plays too many video games. 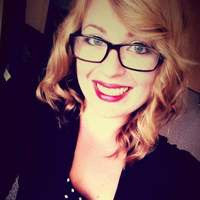 She graduated from the University of the Fraser Valley in 2017 with a BA in English with a Creative Writing Concentration. Abrianna decided to self publish her book after finding it incredibly hard to gain footing in the massive world of agents and publishers. Writing a compelling query letter was a thousand times harder than writing her book...so she took the plunge and released her book herself. The Fractured Soul is a two-part story, the first being Akairya. Available on Amazon and Abrianna's personal eStore, Akairya is a fast paced introduction to the world of Alkairyn and the sickness that plagues it. Go to www.abriannaleaming.com or Amazon to order your copy today!